I seem to have an affinity for BMW wagons. Well alright, who am I kidding? Don’t we all? It’s a formula that proves to be flawless. It’s a driver’s car that doubles as a doer’s car. It’ll carry your small furniture, haul your kids to school, round up all your gear for a road trip and still draw a crowd at a car meet. It’s the Swiss — or in this case — German army knife of automobiles. So then what if you take all that and further the ideology? What if the notion of a do-it-all wagon with the road manners of a true driver’s car still just seems too pedestrian? 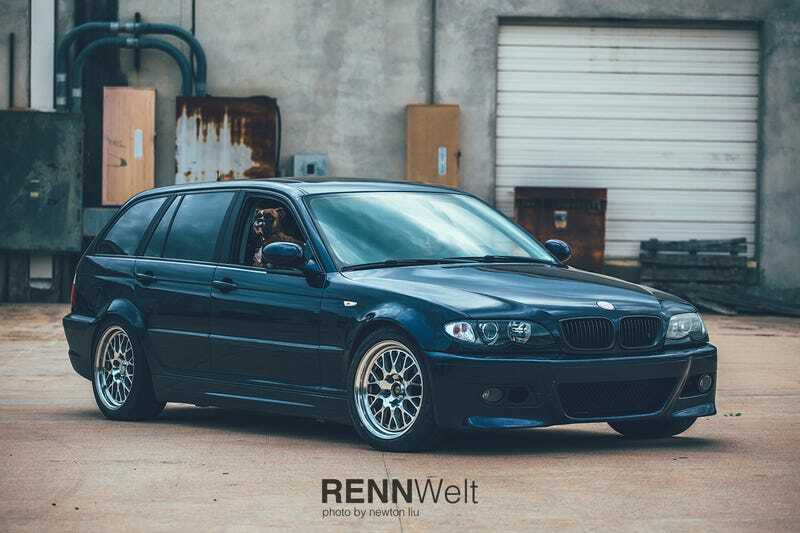 Enter Juliann’s BMW E46 3-series Touring. From afar, it may look unassuming until you realize up close it’s no standard E46 wagon at all. Yes, that’s a BMW S54. Juliann purchased this wagon with the keen understanding this car is essentially a E46 M3 with a bit of extra cargo space. And for the unaware, BMW never actually green-lighted a E46 M3 Touring for production. Once again, we bid grace to the car gods for the concept of an engine swap. There are those who may wince at the sight of dog paws on the seats of an enthusiast’s car, but to Juliann her E46 serves a function. It is not a garage queen or a show car. It is not the puzzle piece of a collector and it does not serve to appease the perfectionist. Juliann’s E46 is the performance wagon BMW hoped people would understand. It’s everything you need and then, in the case with this particular car, a little extra of what we would all want. At week’s end Juliann proves that her car is every bit of a driver’s car on the track. Being a E46, it receives most aftermarket parts from the sedans all the same. Slapping a coilover system and big brake kit on enables the car to rotate around corners faster than any vehicle of utility has a right to. Of course, the true value of the car is that it renders fellow racers little knowledge of what it actually accomplishes off the track.